The Kid loves cornbread, so when I had some leftover, I paired it with turkey bacon to pack in his lunchbox. I also decided to try out an idea I've had for cooking the turkey bacon so that it is both easier to pack and less likely to crumble. 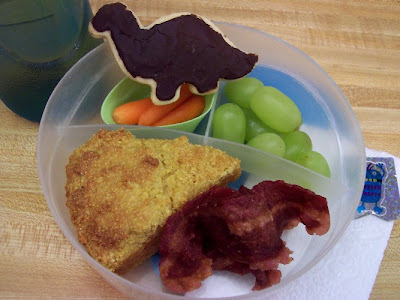 First, the contents of the lunch are a piece of cornbread baked in a cast iron scone pan to get the triangular shape, two slices of turkey bacon, green grapes, a few baby carrots*, and a dinosaur cookie covered in chocolate. (I'm still tweaking the recipe for roll out cookies, but hopefully I'll have it up soon.) It's accompanied by the usual apple juice/water mix and a monster sticker (roar!) for Halloween season. Turkey bacon is another favorite of The Kid's. 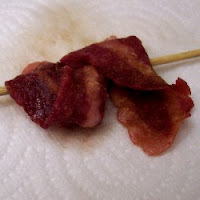 It's a lot chewier and less brittle than the nasty, greasy pork kind, so I thought it might be possible to place it in a more convenient shape, then cook it in the microwave for a longer period at a lower setting. 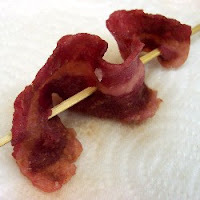 To hold the turkey bacon in position, I slid two slices in curves onto a skewer on a piece of paper towel. I tried to make sure that the bacon supported itself on its side, so it didn't fall over onto itself. I turned the microwave down to the defrost setting, and cooked the turkey bacon uncovered for between ten and fifteen minutes, checking it regularly. (I may have let it go longer than necessary, since I'm a salmonella phobe.) There was a little bit of splatter, but much less than I was afraid might happen. I had mixed results. Once slice turned out perfectly, the other did indeed collapse onto itself and cook into that position. I put both of them into the lunch box, anyway. *Say, aren't those carrots in one of those little food cups? I thought you said you were going to keep it simple and resist the siren call of the bento. It looks suspiciously like someone got a box of goodies from Ichiban Kan! Well, [looks down at feet] the carrots and the dinosaur do need the food cup to successfully cohabitate! The truth is that The Kid is in a lunch rut, where all he wants are Sunbutter and jelly dinosaur sandwiches, grapes, and pretzels. So I had the excuse I needed to succumb, and may be drifting into bento territory in the near future, or at least poaching some techniques. I'm submitting this lunchbox to Margo at Coffee and Vanilla for her awesome monthly Wholesome Lunchbox Round Up, as well as trolling around over there myself in search of some new ideas! i like that idea...i especially like your comment about being a samonella phobe when cooking the bacon. i am the same way when i make a cans of soup for my kids lunchboxes...overboiling the soup and then only putting it into the thermos until the last second! lol!anyway, i love the great info on your site too, can i add your link to my blog? I am so jealous of your dinosaur cookie cutters. My daughter LOVES dinos, but I can't find them anywhere here! Very cute :) Thank you for your entry Libby! We made a detour while visiting San Francisco, just to go the Ichiban Kan...hubby grumbling and smiling at me the whole way. But I got some great stuff! 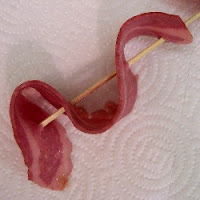 I love the wavy slice of turkey bacon. It reminds me of what they do to fish on Iron Chef.